This is a hidden object game from the same developers of Paparazzi. It has a very similar design to the previous game, where instead of removing objects from the scenery, the player has to take Polaroid pictures of them. A list of photo subjects at the top shows all the required objects that must be photographed within a time limit. Taking snaps while following the list order gives extra points. The assistant character at the top-left serves as the hint button, showing the position of one of the required objects but removing thirty seconds from the timer as a penalty. 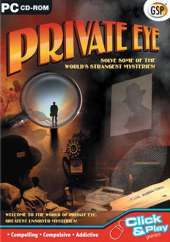 Hired as private detective, the player must go around the world investigating a criminal organization called "The Enigma Society". Some locations have an extra scenery, usually presented as a container of some sort, that brings up a separate hidden object screen with its own list. Bonus games appear between assignments, where the player has to find the differences between two similar images, or find a series of words among a pile of them that keep fading in and out of the screen.